The folks at ENR.com have posted an article by Nadine Post that we think accurately portrays the promise and the potential of Modular Construction WHEN ITS USED PROPERLY, and the downside when it is not. Just like any construction technology, Modular must be implemented properly to achieve the reward of improved quality, reduced schedule and reduced cost. We thank Nadine for an excellent article. Modular-building boosters, including traditional owners, developers, contractors and designers, maintain that off-site construction is faster, safer, leaner, greener, better quality and potentially less costly than site construction. But there is a big hitch, they caution: Building teams are not likely to reach modular delivery’s pot of gold unless they plan and execute the off-site strategy properly. And that is no simple proposition. Few know that better than developer Forest City Ratner Cos. (FCRC) and its team building the world’s future tallest modular tower: the 32-story B2 BKLYN residential building in Brooklyn, N.Y. Stalled at 10 stories, the B2 project at the $4.9-billion Pacific Park Brooklyn site, until recently called Atlantic Yards, is a glaring example of modular gone sour. The B2 project, designed by SHoP Architects, was going to take factory-built modular to the next level through the use of sophisticated digital tools to design, fabricate and manage assembly of the 930 modules. Instead of a poster child for improved high-rise modular, B2 has become the poster child for modular run amok. Unable to solve their differences privately over delays and cost overruns, FCRC and Skanska USA Building Inc.—B2’s construction manager and FCRC’s partner in a new modular plant, called FC+Skanska Modular—are battling it out in court. Despite the situation, both Skanska and FCRC say they are committed to factory-built modular. “We believe in modular as the future of the industry,” says Richard A. Kennedy, Skanska’s co-chief operating officer. Modular-building veterans are rattled by the B2 feud. “I’m angry because it gave this industry a black eye,” says Tom O’Hara, vice president for business development at Capsys Corp. The factory builder is supplying modules for a 65-unit residential building in the Bronx, N.Y., called 3361 Third Avenue. Modular is of interest to traditional builders because, in part, it has been identified as a means for improving building production. Collaborative delivery and advances in digital tools for design, coordination, clash detection, project management and fabrication support the movement, as do advances in lifting equipment. “This is not a new process, but there is newfound interest of late,” says Tom Hardiman, executive director of the Modular Building Institute (MBI). Until 2009, the 31-year-old MBI had no traditional contractor members. Now, there are a dozen, including Gilbane Building Co., Mortenson Construction and PCL, but not Skanska or FCRC. Off-site construction is most apppropriate for buildings with repetition, including schools, housing, hospitals, multifamily residential, hotels and dormitories. Many recent modular buildings are a mix of site-built, non-repetitive lower floors topped by assemblies. To the NIBS council, “off-site construction” is the design, fabrication and assembly of building elements at a location other than their installed location. “Off-site construction is characterized by an integrated planning and supply-chain optimization strategy,” says the council, in its draft off-site construction glossary. Permanent modular construction, also known as volumetric or 3D modular, is a subset of off-site. NIBS defines it as “an innovative, sustainable construction delivery method utilizing off-site, lean manufacturing techniques to prefabricate single or multistory whole building solutions in deliverable module sections.” PMC buildings are made in a safe, controlled setting and can be framed in wood, steel or concrete. Modules can be delivered with mechanical-electrical-plumbing systems, fixtures and interior finishes. “Not easy” is an understatement for the first residential rodeo of FCRC and Skanska. Sited up against the two-year-old Barclays Center arena, B2 is already more than a year behind its original December completion date. On Aug. 27, Skanska stopped work at both the site and the FC+Skanska Modular plant, furloughing more than 150 workers and raising the ire of Forest City. Lawsuits have followed. John Erb, vice president of sales and marketing for Deluxe Building Systems Inc., says, “If a project goes awry, it means the team didn’t know the process. It’s like me trying to perform open-heart surgery tomorrow without any training.” Deluxe supplied modules for the 90.5-ft-tall Stack, the U.S. record-holder for the tallest completed modular building. Factory modular is “a science” and “outsiders” should not venture into the business, which is drastically different from traditional site construction, says Capsys’ O’Hara. There are flaws in the B2 scheme, say those experienced with modular, especially the “still” construction plan developed by XSite Modular—Forest City’s modular-business partner-consultant before Skanska. Unlike an assembly line, still construction is built in place by teams, each assigned to a vertical line of identical units. The approach and the 913 unique modules do not take advantage of the efficiencies of assembly-line production, say modular experts. O’Hara also maintains that the B2 modules, which include facade panels, are too complete. Most modules don’t include the panels because they often cause alignment problems during field fit-up. FCRC and Skanska declined to comment on the criticism of their approach. Modular delivery disrupts the economics, workflow, contracts, coordination points, insurance and building regulations of conventional site-built projects. There can be issues with the union building trades. Off-site delivery raises questions even about warranties versus bonding. Is a bathroom pod a product or not? Plan review also must be completed early, but most buildings departments are not geared up for this. Global Building Modules—with FXFowle Architects as architect, LERA as structural engineer and Dagher Engineering as mechanical engineer—is trying to market a patented modular system that would solve some of the transportation issues. The concept calls for steel-framed modules that are dimensionally the same as shipping containers; the modules could be produced in port areas of cheap labor and shipped by sea and rail to sites. So far, there have been no takers. “Everyone is always blown away by how technically resolved the idea is, but each asks, ‘Who has done a building?’ ” says David Wallance, a senior associate at FXFowle. Project Frog has demonstrated a way around flat-bed-truck limitations for 3D modules. The company supplies kits of parts to the site; only bathroom pods are 3D. “Flat-pack construction is affordable to ship,” says Ann Hand, Project Frog’s president and CEO. Modular delivery relies on owner buy-in and early team collaboration. With 3D modular, there is no fast-tracking, but there is resequencing. Design decisions have to be finalized up front, to allow prospective modular builders to price the job and the winner to order supplies. “Bathroom finish colors and tile patterns are not typically set during the foundation-document phase,” says Maja Rosenquist, project director with Mortenson Construction for the $623-million Exempla Saint Joseph Hospital, which has off-site-built elements and is nearing completion in Denver. The early decisions for the Bronx project “put enormous pressure on us,” says James McCullar. His eponymous firm is the architect for the 64-module project. Discounting glitches with the buildings department that caused a three-month delay, the Stack would have taken two-thirds the time of site construction, says Peter Gluck, of Gluck+, the Stack’s architect design-builder. Mortenson commissioned the University of Colorado, Boulder, to do a study on its 831,000-sq-ft Denver project to compare it to site construction. The study concluded that the prefab approach for utility racks, bathroom pods, exterior panels and head walls reduced the schedule by 72 work days. The job used 29,500 fewer hours of labor, resulting in $2.6 million in productivity savings, and diverted 150,000 hours of labor off-site. There was $4.3 million in indirect cost savings, but direct costs were 6% more than site construction, according to the study. “Certain elements were more expensive until the indirect costs were accounted for,” thanks to the fear factor in the pricing, says Bill Gregor, Mortenson’s construction executive for the hospital. Mortenson holds a prefab charrette to determine the off-site path for a project. Another important step is a full-scale prototype to avoid repeating a mistake hundreds of times. Some say design-build is the best delivery system for modular, but any collaborative approach will work. Architect James B. Guthrie, president of Miletus Group Inc., a modular design-build firm, has doubts about modular becoming mainstream any time soon. Until there is a better knowledge base and a better supply chain, “modular won’t become widespread,” he says. The NIBS council was formed to fill the knowledge gap and gather metrics to prove the case, especially to reluctant owners. “We’ve recognized it’s a challenge to capture some of the potential efficiencies,” says Colker. To help foster off-site, the council recently posted two online surveys. The deadline for responses is Oct. 15. The industry survey, available online here, is intended to identify the opportunities and challenges associated with the use of off-site construction processes and technologies. The academic survey, available online here, will determine the scope of off-site construction teaching and research in U.S. colleges and universities. Results will be used to support the development of tools and resources for the schools. The council also is seeking $150,000 for an off-site construction implementation guide, to help demystify the process. Demystification is already under way in the U.K., home to the world’s tallest completed modular tower: a 24-story dorm at the University of Wolverhampton. The 10-year-old industry group Buildoffsite has published hundreds of case studies that detail the benefits of off-site solutions. They are available at www.buildoffsite.com. Pitfalls aside, mainstream builders’ move toward modular delivery is a logical step in one of biggest transformations in the construction industry since the introduction of the combustion engine and electric power, says Gilbane’s Klawans. 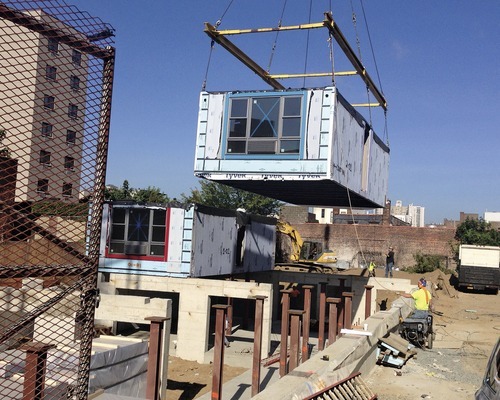 A modular building project in the Bronx is moving along, with four of its 64 total modules added each day.